New apartment =s new kitchen =s gas range =s GAME. CHANGING. Eh, eff it. Let’s just cook. 1.) Prep celery, parsnips, carrots, potatoes, onion and garlic. Preheat oven to 350 degrees. 2.) Place roasting pan across two stovetop burners set to medium heat; add olive oil and all roasting vegetables, including leaves from rosemary sprigs. 3.) Roast vegetables until they begin to soften and start browning, or about 10-15 minutes, stirring occasionally to evenly distribute heat. Salt and pepper to taste. 4.) 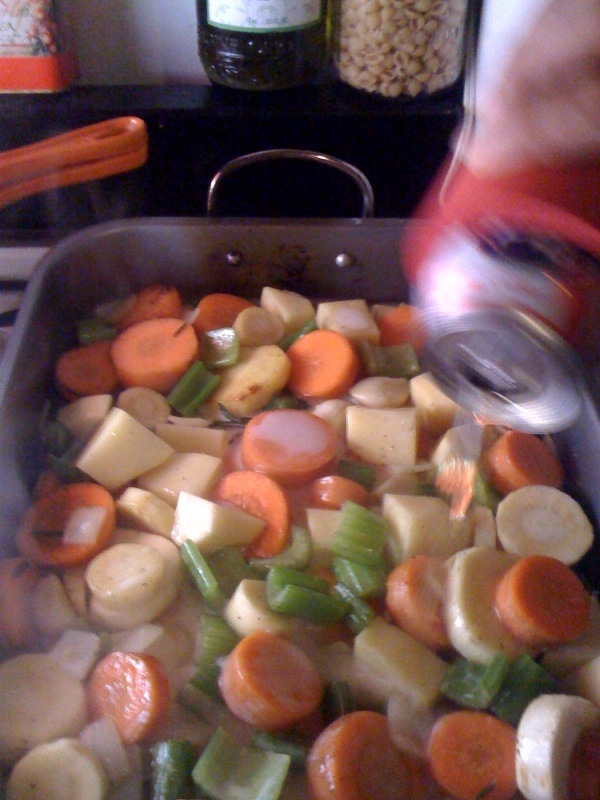 Fun alert: As the olive oil dissipates, pour beer over the vegetables. 5.) To prep the chicken, tuck several slices of lemon underneath the skin and line chicken cavity with sprigs of rosemary. Salt and pepper generously. 6.) Once the vegetables have begun to soften — but are still mostly firm — turn off heat. Stuff chicken cavity with vegetable mixture and sliced lemon. 9.) 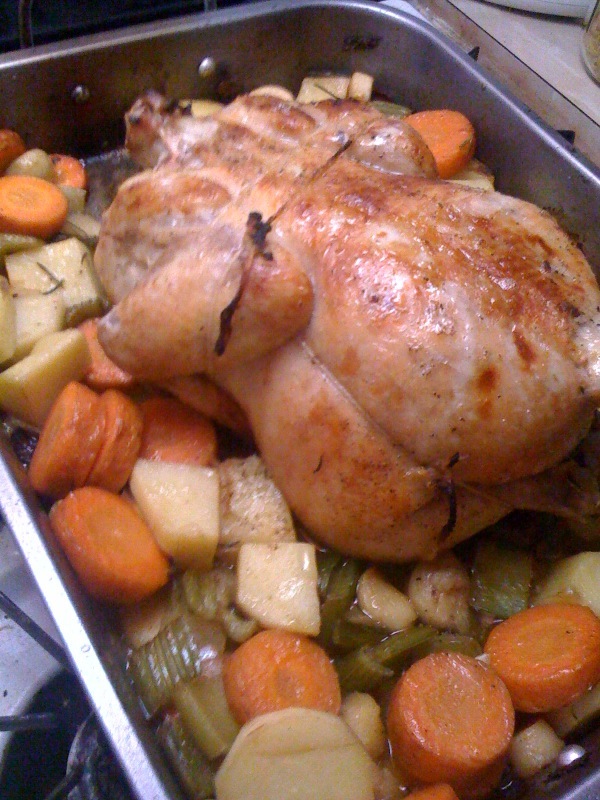 At least twice during the cooking time, baste chicken with the broth utilizing a deep spoon or a baster. 10.) For the final 10 minutes, flip the chicken over so the reverse side has a chance to brown. Let the chicken rest a few minutes, then dive in! 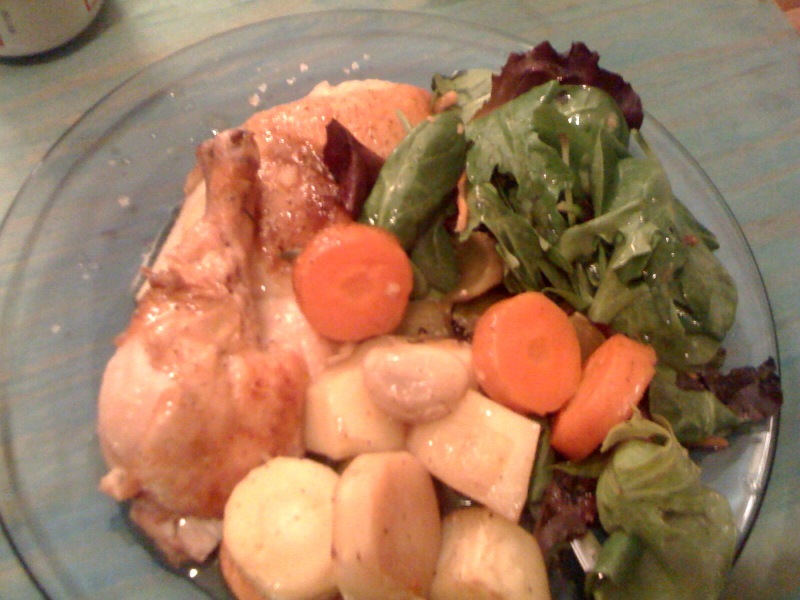 We suggest plating the chicken and vegetables with a small side salad, and paring with the same beer you used to cook.